For the last few years, Razer, known for its gaming PCs and accessories, has been making the Razer Blade Stealth, an ultrabook that's quite sleek and snazzy. 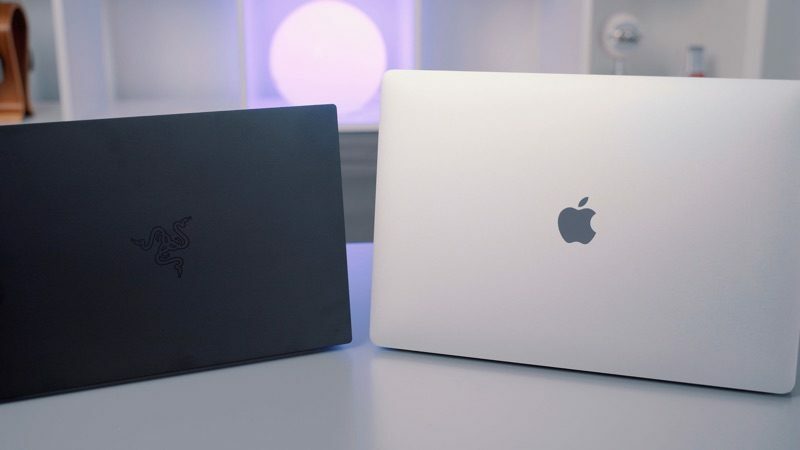 We went hands-on with the latest version of the Razer Blade Stealth, released in 2019, to see how it compares with Apple's MacBook options. The Razer Blade Stealth, for those unfamiliar with it, is a 13-inch ultrabook offering solid performance in a slim, compact package. It has an aesthetic reminiscent of the MacBook Pro, which is also super slim, but it looks quite a bit different with a black aluminum unibody and squared edges. Most notably, the Razer Blade Stealth has an option for a 4K display, which is the version we have on hand. You might think a 4K display would look way better than the the lower-resolution displays on Apple's Retina MacBook Air and MacBook Pro, but on such a small machine, it's not as noticeable as you'd expect. The display is touch sensitive, which is not a feature on Apple's laptops, and it has super narrow side bezels so it has a clean, modern look. The keyboard has more travel than the butterfly keys of the MacBook line, but not as much clickiness, and there's a full set of physical function keys instead of a Touch Bar. This is Razer we're talking about, so naturally there's customizable RBG backlighting for the keyboard that can be set to different colors and themes. There's a much smaller trackpad, but it's still nice to use and one of the better non-Apple trackpads we've tried. There's no fingerprint sensor like on the MacBook Pro and MacBook Air, but there is a Windows Hello facial recognition option. When it comes to ports, the Razer Blade Stealth has two USB-C ports and two USB-A ports, along with a 3.5mm headphone jack. Just one USB-C port is Thunderbolt 3 capable, compared to four on all of Apple's USB-C MacBook Pro models. 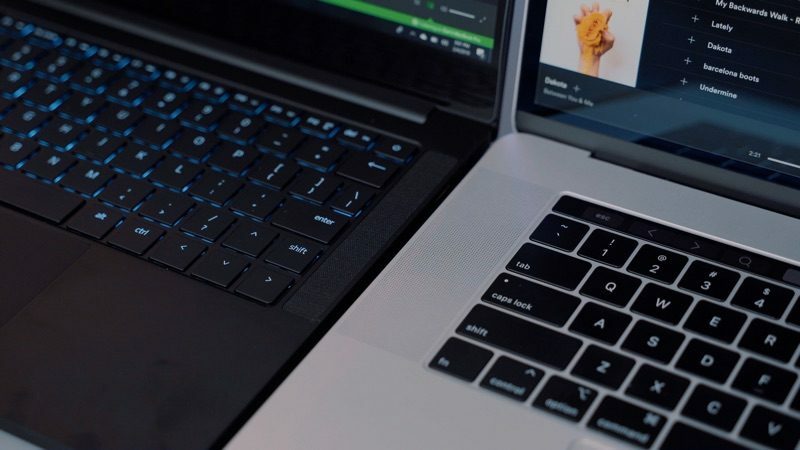 The Razer Blade Stealth is equipped with 16GB RAM, a quad-core 1.8GHz 8th-generation Intel Core i7 processor, and a dedicated Nvidia GeForce MX150 graphics card. Apple's 13-inch MacBook Pros, the closest in form factor to the Razer Blade Stealth, have an integrated GPU. Benchmarks indicate the Razer Blade Stealth outperforms the 13-inch MacBook Pro, especially when it comes to the GPU. That's not unexpected, though, because Razer is a gaming company. Razer also sells the Razer Blade Stealth alongside the Razer Core X external GPU to offer desktop-quality gaming. In our testing, the Razer Blade Stealth did well with everything we threw at it, including browsing the web, watching videos, editing video with Adobe Premiere Pro, and some light gaming. Unigine Heaven benchmarks required us to drop the resolution to 1080p from 4K to get 60 to 70 frames per second, though, and it struggled at the full 4K resolution for gaming. On an OpenCL test, the Razer Blade Steath scored 47,237 with the GeForce MX150 and 36,488 for the integrated Intel Graphics 620. For comparison's sake, the built-in GPU in the 2018 15-inch MacBook Pro scored 23,624, and the AMD Radeon Pro 555X scored 50,257. 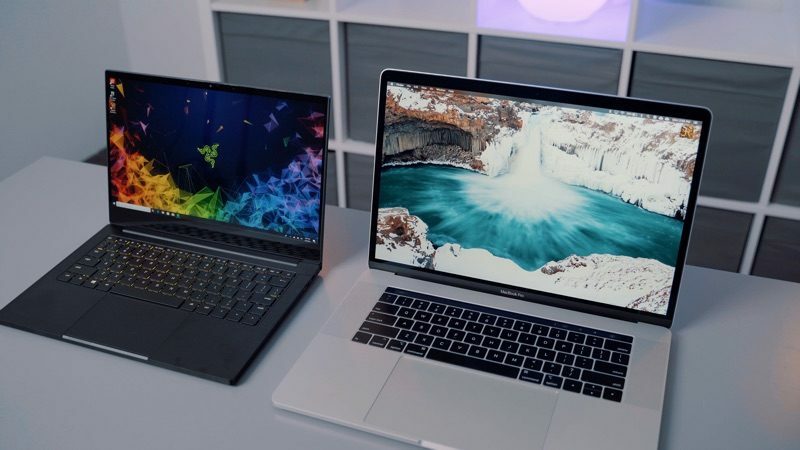 That's a little bit like comparing apples to oranges, though, as the 15-inch MacBook Pro is a bigger machine and the 13-inch model, which is a closer comparison to the Razer, has no dedicated graphics. Battery life in the Razer Blade Stealth is okay. It's lasted for about six hours for tasks like web browsing and emails, but for more system intensive tasks, it can drain in less than three hours because of the power draw of the 4K display. When it comes to price, Razer is charging a premium for its ultrabook, much like Apple does with its notebooks. The 4K 13-inch model we have on hand with the MX150 graphics card is priced at $1,900, though Razer offers lower tiers priced at $1,600 (no 4K) and $1,300 (no 4K and integrated graphics). Given these price points, the Razer Blade Stealth is tough to recommend over other PC options, but it's powerful, portable, and gorgeous. What do you think of the Razer Blade Stealth? Let us know in the comments. The Razor Blade Steath looks pretty good. Great features. Now if only it didn’t run the abomination called Windows 10. Razer Blade got a vapor chamber cooling system which is way better than MacBook Pro. You must be joking, surely? It has a 4K display and a dedicated GPU. It’s far better value than most of the MacBook Pro’s/MacBooks and you never mention the price being a reason not to buy those. I didn’t buy a MacBook for the hardware. Has anyone noticed how buggy Windows 10 is with high resolution displays? Some apps on my Windows (work) laptop have tiny or huge UI elements, and Windows 10 feels so unpolished to me. That's enough to keep me away form this laptop. I wish I could use a MacBook at work. Given these price points, the Razer Blade Stealth is tough to recommend over other PC options, but it's powerful, portable, and gorgeous. This is rather odd phrasing. At the starting point of $1,399, Apple has a better deal in some ways: the $1,299 13-inch MacBook Pro has a much better integrated GPU (Iris Plus 640 vs. UHD Graphics 620), but last generation's CPU (both of which is Intel's fault: you can't get the better graphics on the newer CPU at the same wattage), with half the cores. It also only has half the SSD storage, though. You can double that and come out at $1,499. But then the deals get worse. Configure the Razer with GeForce graphics and twice the RAM, and you're at $1,599. There's no dedicated graphics option at all from Apple, and yet, at 16 GB RAM, you're already looking at $1,699. Or you can go $1,899 for both contenders, and end up with a 512 GB SSD in both cases, but the Razer, again, has dedicated graphics. Want a more comparable CPU? Then you're looking at $1,799 on Apple's end. You gain the Touch Bar and Touch ID. This configuration again has a better integrated GPU than Razer's lowest, but the same amount of RAM and SSD storage, at $400 more. Add the Razer's dedicated GPU, and you basically don't get a comparable offering from Apple. In summary, no, Razer isn't cheap either, but Apple is in most of these configurations more expensive, typically by hundreds of dollars, and no matter what, you can't get a 13-inch dGPU MacBook Pro. Short answer: yeah, unfortunately, DPI scaling is still a mess on Windows. Since Windows 95 (98? ), there has been a slider to set text scaling, and these days, it tends to offer fractional options like 100%, 125%, 200%, 250%. Starting with Windows 8.1, this scale can also differ between displays, so you can have an external display with a different scaling (which these days tends to be a common set up — your laptop is at 200% or more, but your external display is not). And yet… in practice, it doesn't work well. They keep making improvements, keep giving third-party developers more tools, keep iterating, but… it's still a bit of a mess. Apple started out a similar path during the era of 10.4 Tiger, and let developers play with that ('https://arstechnica.com/gadgets/2005/04/macosx-10-4/20/#scalable-ui'). But even in 10.5 Leopard, this feature didn't look ready for prime time ('https://arstechnica.com/gadgets/2007/10/mac-os-x-10-5/9/'). There were numerous visual glitches that boiled down to: scaling a UI to arbitrary sizes sounds like a simple math problem, but really isn't. And it sounds like a cool feature, but is it that useful? This bold approach of allowing arbitrary fractional scale factors was eventually abandoned in favor of only allowing integer factors. Your UI is 1x, 2x (such as on Retina Macs), 3x (such as on the iPhone 6 Plus). That's it. This is much, much simpler to accomplish, as all you have to do when scaling bitmap graphics is turn one pixel into a 2x2 grid or 3x3 grid of pixels. Microsoft keeps trying to do the hard thing. Meanwhile, Apple has accomplished the easier thing. To the user, Apple's approach looks great, and Microsoft's just… doesn't. It's a bolder, more comprehensive approach, but it solves a problem that arguably isn't all that useful to solve, at the cost of a mediocre real-world experience. It has an aesthetic reminiscent of the MacBook Pro, which is also super slim, but it looks quite a bit different with a black aluminum unibody and squared edges. 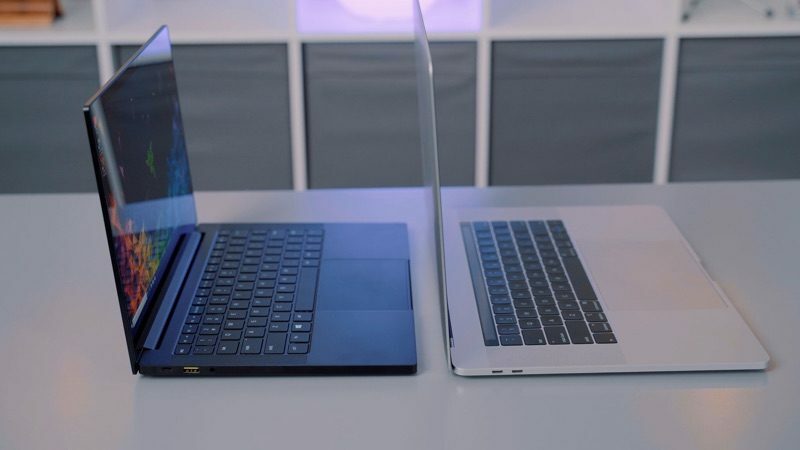 It's like they mixed Apple's old black MacBooks with their current MacBook Pros.